In 1919, after the end of World War I, there were severe shortages and civil unrest in Germany. This situation repeated itself after World War II. These shortages led to a high level of experimentation with ersatz (replacement/alternative) materials such as straw for paper and board, spun paper, ..., silk instead of linen for sewing thread, but also colored straw for inlays (Strohintarsien). Ernst Collin and others wrote articles on the subject in such periodicals as the Archiv für Buchgewerbe, the Buchbinderlehrling, and the Allgemeiner Anzeiger für Buchbindereien. 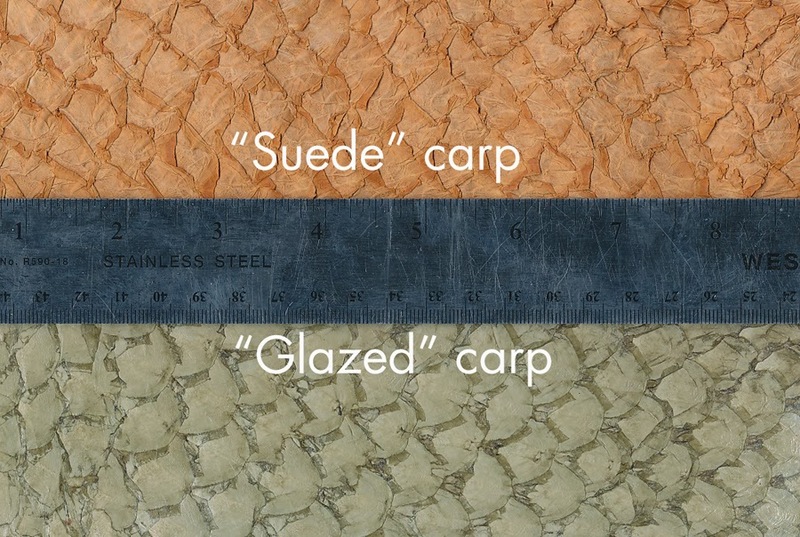 This post is about one of those "ersatz" materials, fish leather. In "Fischhaut zu Bucheinbänden" from the Archiv für Buchgewerbe ( Vol. 56, 1919) the bookbinder Franz Martini of Charlottenburg (Berlin) recounted a war experience in which he saw cod skins that had been pulled off the fish in a field kitchen in Belgium and discarded. 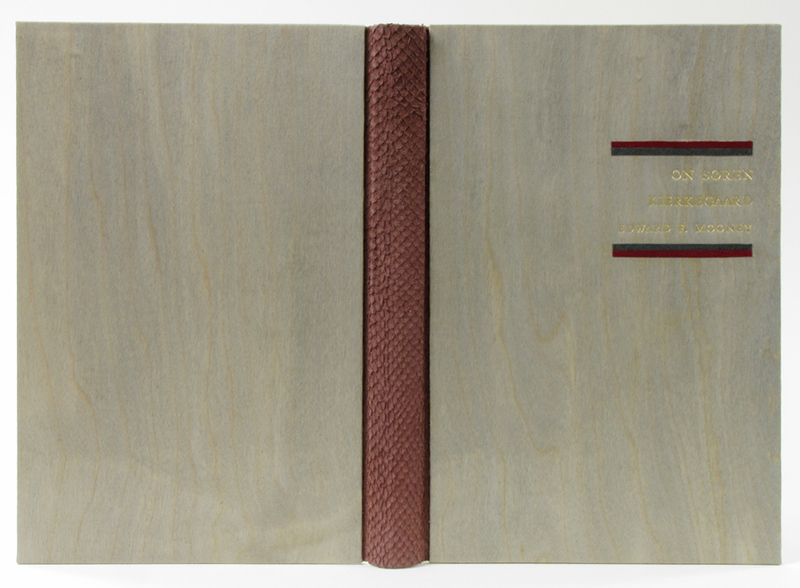 Drawing on his experiences at the bindery of Lüderitz and Bauer, he examined the skins to ensure there were no cuts/tears, then carefully removed the scales and made parchment from them, using them to bind various such as military journals. 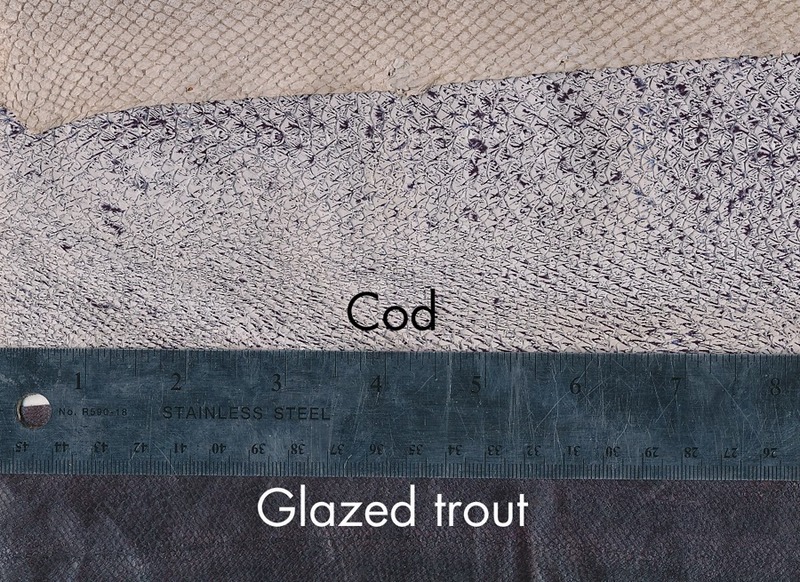 Based on these experiments he deemed the fish parchment superior to calf or sheep for durability and working properties such as the ability to mold over raised cords without wrinkling. Martini had the leather tested at the national testing center on the recommendation of Paul Kersten (Director of the School for Artistic Bookbinding in Berlin), and the Director of Royal Library of Berlin. The results of this testing were impressive, especially in terms of fold and tear strength where the fish parchment easily reached 50,000 double folds without damage. After these tests Martini also developed a way to tan these fish skins to leather, also taking out a "utility model" (Nr. 674 741), a more limited form of patent, on this invention. 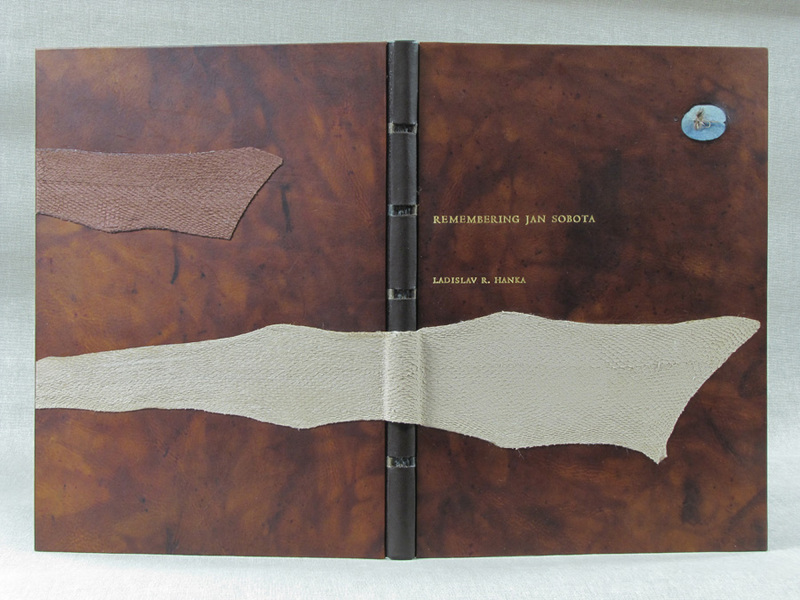 Below some images of bindings he created with these tanned skins from the Archiv für Buchgewerbe. 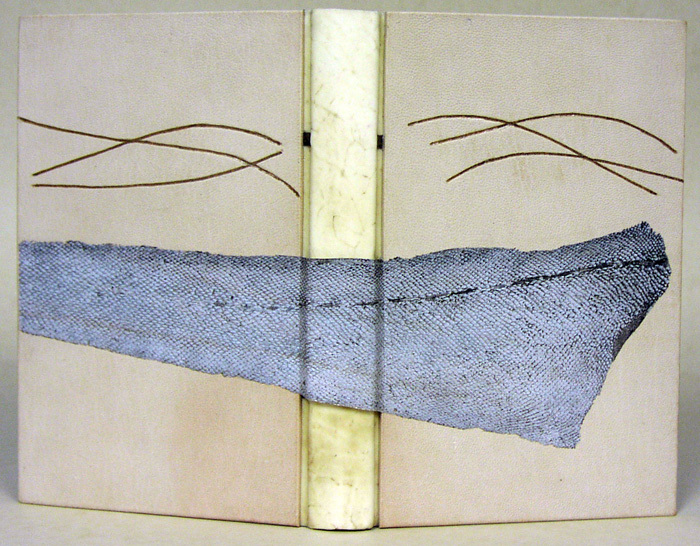 Obviously, fish skins are most suited to half/quarter bindings due to their shape... Images from Archiv für Buchgewerbe ( Vol. 56, 1919). 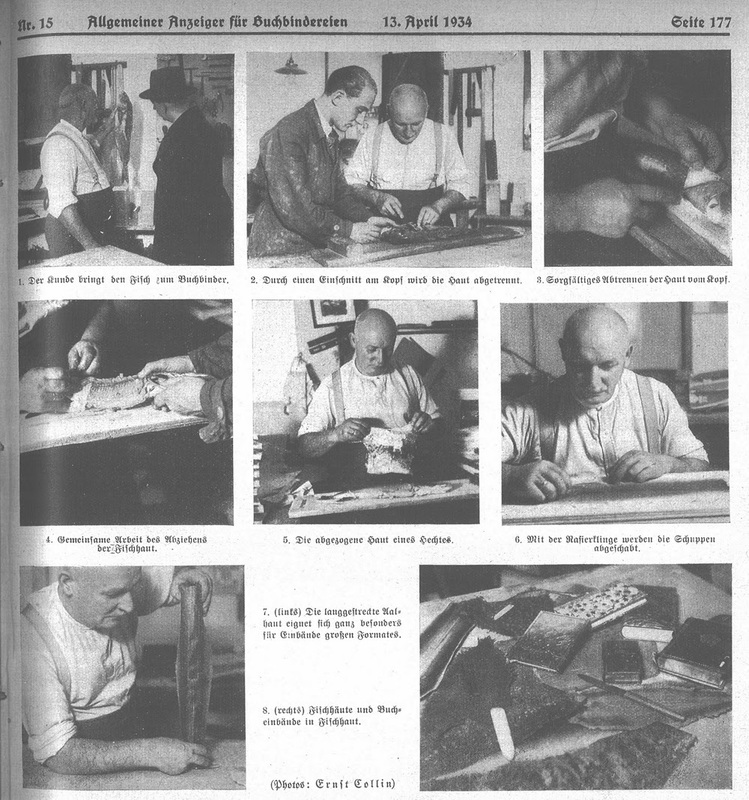 In the 1934 Allgemeiner Anzeiger für Buchbindereien (Vol 49, Nr 19), Ernst Collin wrote an article titled "Bucheinbände aus Fischhaut" ("Bookbindings in Fishleather") that described the process in more detail, illustrated with photographs by Ernst. Shown is the same Franz Martini as mentioned above demonstrating how to remove the skin from the fish and prepare it. Martini has been able to demonstrate the effectiveness of tanning fish on a variety of species including cod, halibut, shark, eel, and others. 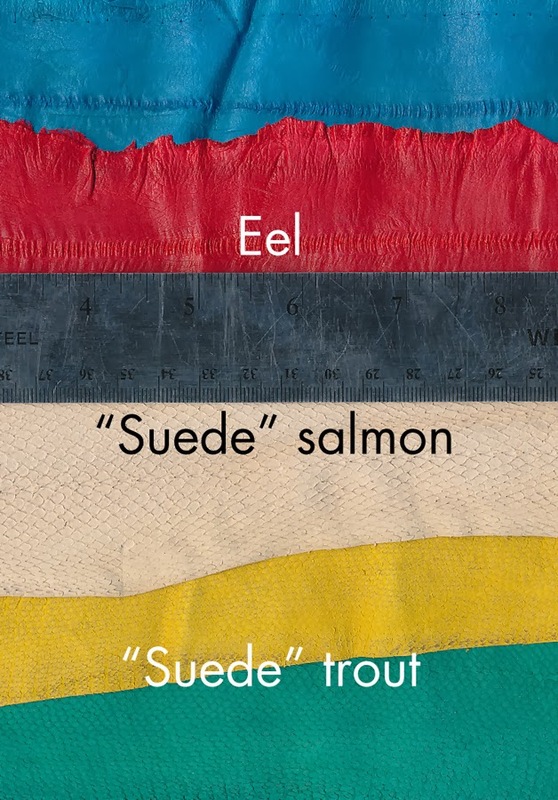 Ernst points out that one of the reasons fish leather is not common is that most consumers prefer to cook the fish with the skin on - he suggests wrapping in gauze for the same effect, the cooking method is not mentioned. The article recaps an earlier article by Paul Kersten from the 1917 (Nr 7) Allgemeiner Anzeiger für Buchbindereien which was similar to the 1919 article mentioned above. Ernst's article also states that Martini's attempt to patent the process failed as it was not unique enough and had been described in earlier publications. Ernst concludes by praising this material and encouraging the German fisheries to take advantage of the need for durable yet affordable native materials to help contribute to sustainability and German economic independence. The fish were carefully skinned and then tanned in rotating drums using a vegetable tannage - summach, dividivi, or willow. Unfortunately the tannins in most domestic plants were not effective enough. To dye the skins, aniline dyes and pigments (for darker colors) were used. Finally, the leather is pressed and glazed. Overall, these processes are identical to tanning other animal skins with an equivalent quality possible. Fish leather retains its flexibility and softness. It is also very resistant to tearing. 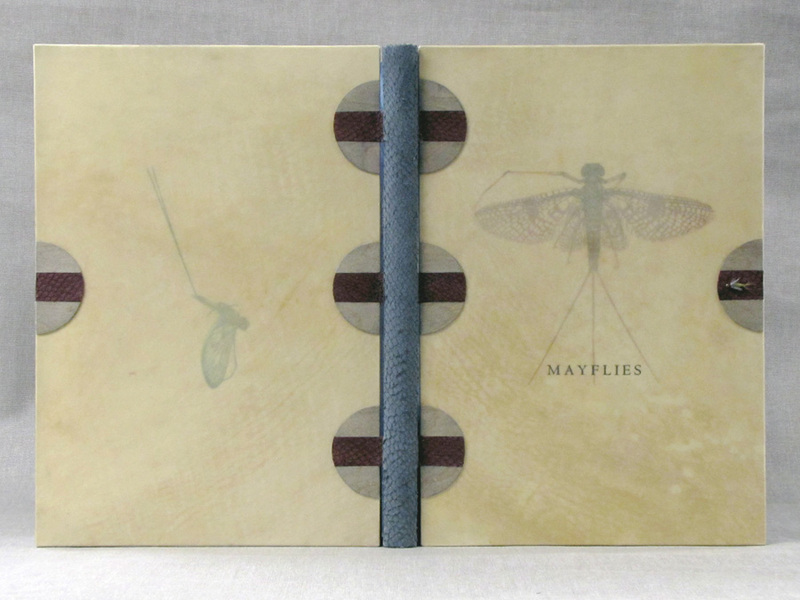 The article concludes by reminding the upcoming bookbinders that this is a material that they will need to become comfortable with, just as all other binding materials. A final article on the subject from the 1946 (Nr 12) issue of the Allgemeiner Anzeiger für Buchbindereien leads with "Fish Leather Developed by Bookbinder." It recaps the articles mentioned above, and concludes by saying fish leather has established itself as a binding (and other leather trades) material, but no one remembers that a bookbinder first developed it. Images of fish leathers below from my leather "stores." Of these the eel is the thinnest and smoothest by far, and only really useable on millimeter bindings, on small/light books, or for onlays. Almost no paring is required for use. 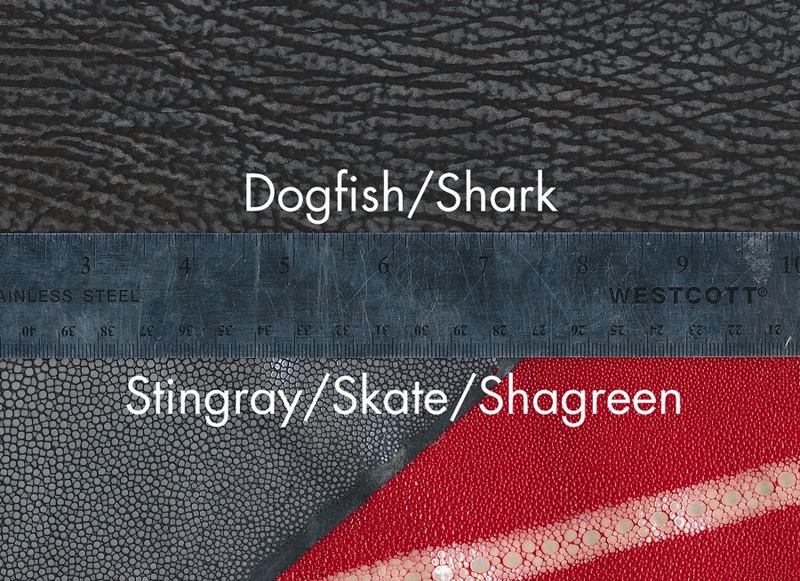 The dogfish/shark and stingray skins are very difficult to pare, the former being very rubbery - kills Scharfix blades, fast. The stingray is very hard and best used as an in/onlay. Cutting with a knife also very difficult. Probably the reason I haven't used it yet. Abigail Bainbridge wrote a great description of working with shagreen for the West Dean College Current Projects blog. Below examples of bindings using fish leather that I have made. Click image to enlarge. Modified Bradel binding (Gebrochener Rücken); textblock sewn on three slips of Cave Paper brown walnut dyed paper; endpapers of Cave Paper brown walnut dyed paper; gilt top edge; sewn silk endbands; Bradel case with 1/4 veined calf vellum spine and undyed goatskin sides; slips laced through at joint; decor of codfish leather onlay and blind tooling. 22.5 x 14.5 x 2.5 cm. Bound 2005. Collection of Karen Hanmer. “Open joint” binding; sewn on 3 brown salmon leather slips; flyleaves and doublures of Cave Paper “layered indigo day” paper; graphite top edge; rolled endbands brown salmon leather; spine covered in gray salmon leather; boards covered in full vellum with printed illustrations from text below; salmon leather slips attached to boards and framed with decorative weathered wood veneer; tied mayfly attached to front board. 26.5 x 19 x 2 cm. Bound 2013. Modified Bradel binding (Gebrochener Rücken); layered Indigo Night Cave Paper endpapers; sewn link stitch on 5 reinforced slips of same paper as ends; endbands of endpaper paper around core; spine covered in brown Kangaroo with cutouts to reveal slips and sewing; boards covered in brown tie-dyed Pergamena deer parchment; onlays of suede Salmon leather with fishing fly mounted into lacuna in parchment; title stamped in gold on front board. 33 x 25.4 x 1 cm.Bound 2013.